Even if the weather’s frigid, people will flock to a city square or park if it’s decorated for the holiday season. Eye-catching holiday decor attracts shoppers, couples, tourists, and families looking to experience the magic of the holiday season. 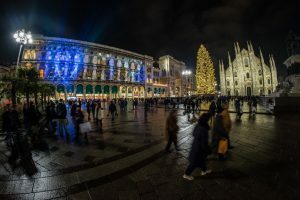 Transforming a public space, however, can be time consuming and costly with traditional touches like string lights, life-size figurines, and giant Christmas trees. Fortunately, gobo projections simplify the process. With gobos, you can set up an entire scene in advance and then bring it to life with a flip of a switch when the holiday season arrives. The potential displays with gobos and gobo projectors go far beyond what you can do with traditional lights. Whether you’re looking to light up an historic architectural wonder, turn an eyesore into a delightful display, or simply complement traditional decor with well-placed projections, a gobo set-up is the ideal solution. Below are some of our favorite stunning holiday displays for public spaces to inspire an installation for your own city or neighborhood. Large city squares are the perfect canvas for gobo projections. 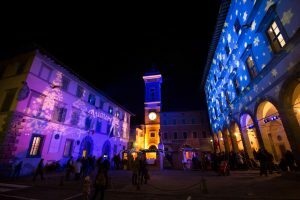 Choose a holiday pattern like the snowflake design above combined with a GOLUX Large-Scale Projector to light up one or more buildings in the square. 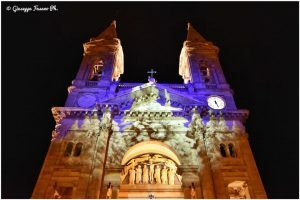 Use uplighting to illuminate beautiful architectural features like an old church or town hall. In Europe, holiday markets featuring local crafts, food, and drink are a popular tradition that draw visitors from around the world. One of the biggest attractions of these holiday events is the transformation of entire downtown piazzas and village squares into magical winter wonderlands. Traditionally this transformation was created with only physical decorations like giant wreaths and Christmas trees. Present day holiday markets, however, incorporate gobo projections into the decor for truly spectacular displays. Gobo projections work on their own for holiday displays but if you love the traditional look of twinkly string lights, why not do both? 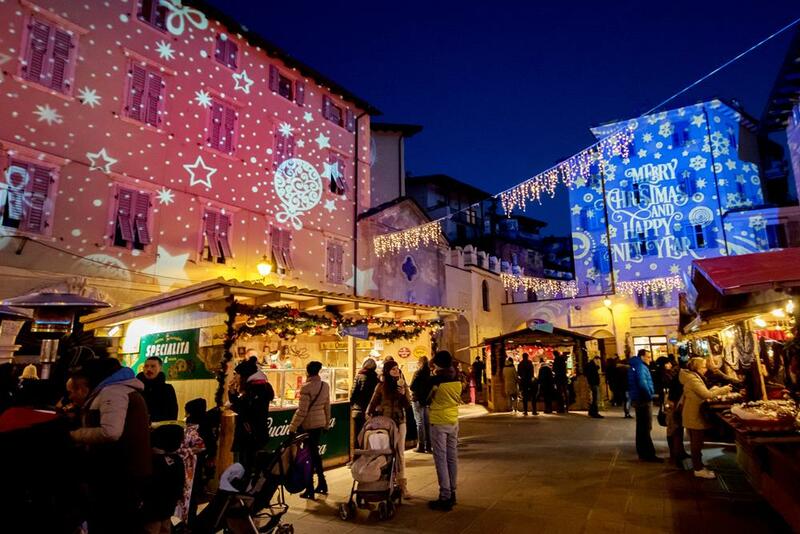 Try hanging string lights above a public street and then blanketing the road and sidewalk with a holiday projection. 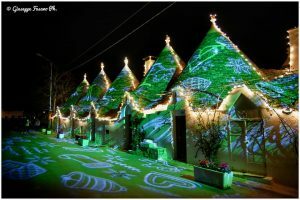 In Alberobello, Italy, the city used string lights to outline the conical rooftops of their traditional trullo buildings and then projected a variety of Christmas images across the entire building facade. Draw visitors to your city’s downtown during the coldest months with a temporary winter-themed art installation. Design a custom gobo that reflects your community or project a wintry scene, like a forest covered in snow, against the backdrop of an iconic building. A giant Christmas tree sparkling with hundreds of tiny lights is often the focal point of city squares and parks during the holiday season. While a real tree is beautiful, it’s also expensive, wasteful, and challenging to procure and set-up year after year. Some cities have opted instead to project a life-size tree against a central building. This modern option conserves budget (and installation time) by investing in a set-up they can use again the following season. Choose from one of our stock tree designs like the golden Town Square Christmas Tree, Green Christmas Tree, or Moonlight Snow-Covered Tree. You can also design a custom tree with projected decorations that pay homage to downtown businesses, your local sports teams, or sponsors of your holiday parade or other public festivities. Posted on August 28, 2018 by gobosour. This entry was posted in Design, Events and tagged Christmas lights, Christmas tree, commercial lighting, custom gobo, custom gobos, ECO Spot projectors, full-color gobos, gobo projector, holiday lighting, holiday projections, lighting effects, outdoor projection. Bookmark the permalink.